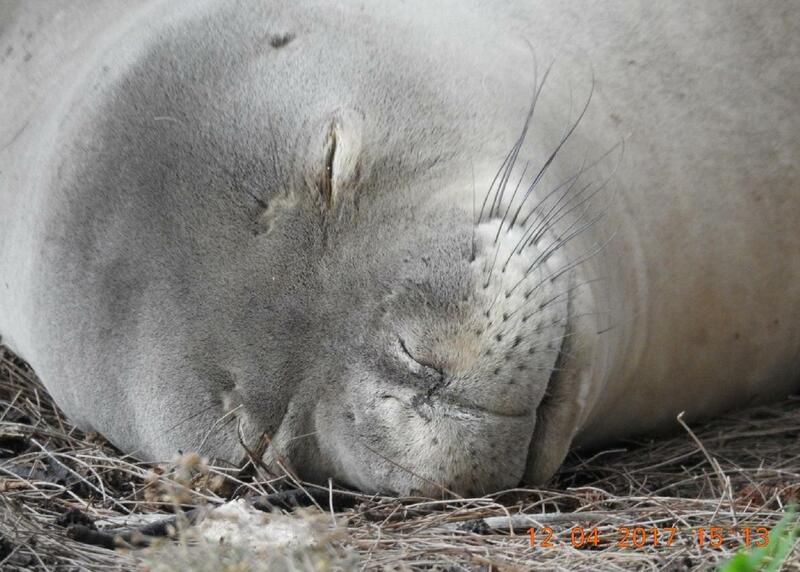 Endangered Hawaiian Monk Seal, Kaimana, looking momona and happy in her new digs along Oahu's North Shore. Born June 28 or early 29, 2017, she spent 46 days in Waikiki before weaning and being relocated to a more remote location. She's been seen traveling along a ten mile stretch of coastline and miles out to sea. Update on Kaimana, the Hawaiian Monk Seal born in Waikiki June 29, 2017. 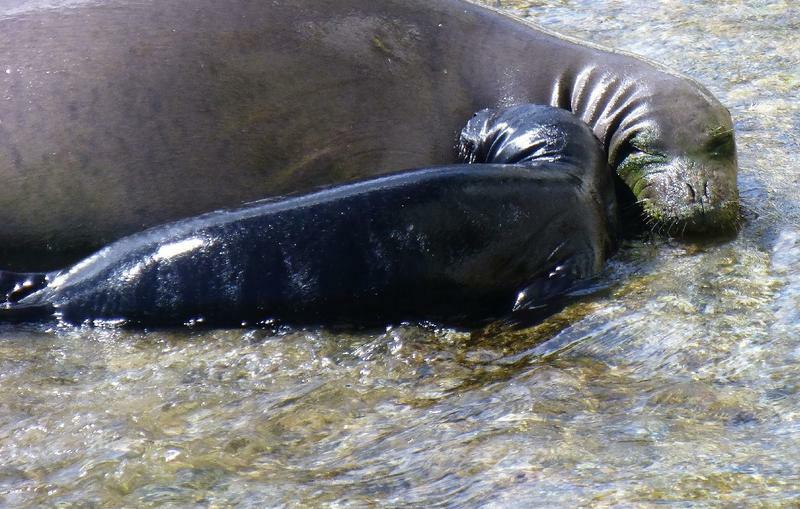 In this interview, Jon Gelman, President of Hawaii Marine Animal Response, describes how to tell the difference between male and female monk seals, the mating ritual which sometimes involves serious "mobbing" injuries, and the weaning process (very short.) He also discusses sea turtles seen in Hawaiian waters. and the work of his organization. Hawaiian monk seals are one of the most endangered marine animals in the world, according to the National Oceanic and Atmospheric Administration, and yet, in 2017, a blubbery female, Rocky, afforded a magnificent wildlife viewing opportunity to average beachgoers in Waikīkī. 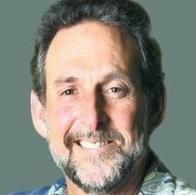 Jon Gelman is president of Hawai‘i Marine Animal Response, HMAR, designated first responders for monk seals, turtles and other marine mammals on O‘ahu and Moloka‘i. 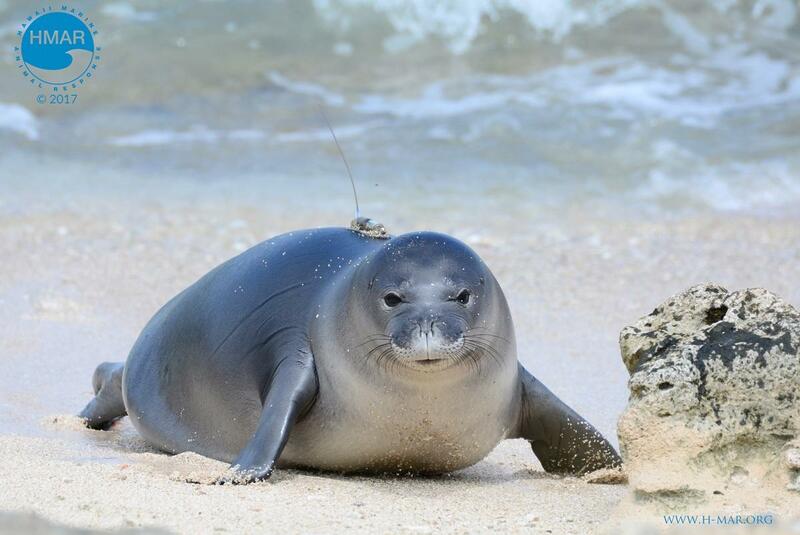 That means the HMAR team was first on the scene at busy Kaimana Beach when Rocky the Hawaiian monk seal was spotted with a tiny pup the morning of June 29th . Gelman: The call came in early, around 5:30 or 6. We dispatched a couple of responders there in minutes and we very quickly identified the mom as RH58, which is Rocky. Within an hour, hour and a half, we were pretty well established on the beach with a semi-permanent perimeter. Rocky is a frequent visitor to Waikīkī. About 17 years old, she has pupped ten times already, and all Rocky’s other pups had been born on Kaua‘i. Why would she pup in Waikīkī? Gelman: Nobody can really speculate. She is regularly seen in Waikīkī, she’s comfortable there on those beaches so it could be she just ran out of time. Gelman says Rocky’s pup, named after her birthplace, Kaimana, seemed to have a fairly normal childhood from a biological standpoint. 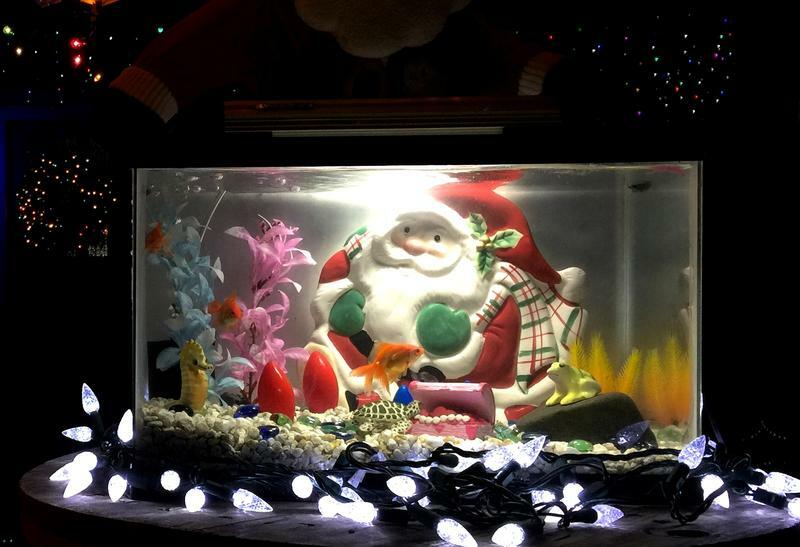 The only unusual thing seems to be the amount of attention she got. Gelman: We estimate just people on the beach was an average of at least a thousand to two thousand people a day. She was there about 46, 47 days. In conjunction with that, there was a webcam put up by Civil Beat in partnership with us and we know that webcam got over two million hits during that five to six week period. This is people coming from all over the world, checking it out and seeing Kaimana on the beach. Kaimana would swim down the beach, she’d swim up the beach, she’d hang out over near the Outrigger Canoe Club, she’d move back to Kaimana Beach. Gelman: As she got older and she started to beef up weight and started to get muscle tone, and she started to learn how to interact in the water, mom took her out, further and further and further. Before the pup was weaned she had gone as far east as Diamond Head and west to Queen’s Surf. Staff and volunteers with HMAR followed the pair continually, making sure onlookers stayed 50 feet away and out of interaction range. Gelman: Then there was the natatorium. Three events that were heart stopping for all involved. As part of her coming of age, Kaimana ventured into the hoary waters of the long defunct natatorium. She had to be extracted once, and rescued 2 more times by her mom. In a huge transfer of nutrients, Kaimana, went from looking like a sock to more like a three foot potato. 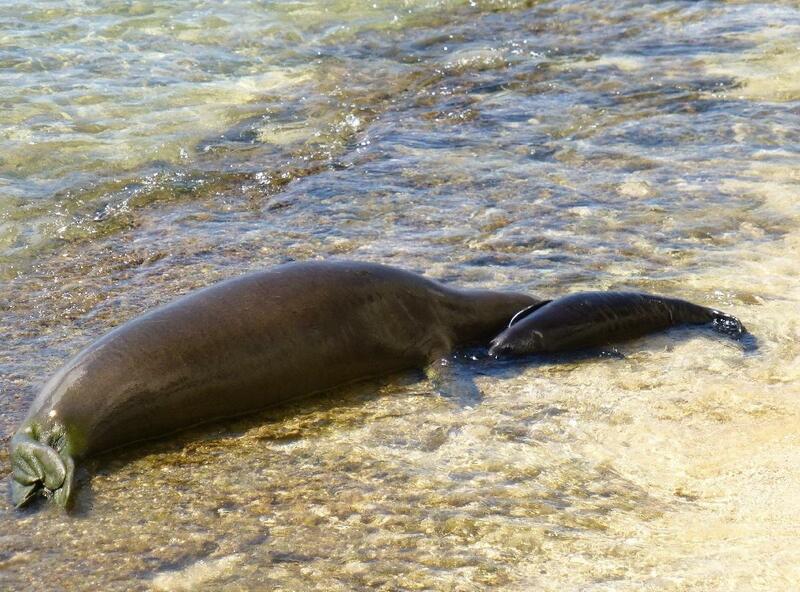 Unlike other pinnipeds, monk seal mothers do not feed while nursing, nearly six weeks. Gelman: They stay there, and they stay there, then, you’ll see them try to push the pup to be more independent. Let’s go out swimming, start to move away from the animal, so that that day comes when they just go away. Monk seals tend to have a very abrupt, what is called a catastrophic weaning, where the mom just leaves. The two times I’ve seen it it’s happened during play time. Gelman: I’ll give you a real world example. We were monitoring PO2, a seal pup born on the Mokulua islands. Mom and pup were socializing for about five weeks, playing, nursing, socializing. One day, the mom went out with the pup and the pup got a little sidetracked, interested in something else, and the mom went the other way and just swam out. She looked back once and she just kept on going. The pup hauled out on the beach and just laid there. Gelman: A week later, the mom was back, and it was like they didn’t even know each other. There was none of this, You’re my mom! Oh my God! There were two seals. Our emotion says, Go hug him! Can’t you tell that’s mom? But it’s almost like you turned a light switch off. Kaimana resting on the beach. HMAR President Jon Gelman says by the time we see seals resting on the beach, they may have been out foraging in the ocean for eight to eighteen hours. Hawaiian Monk Seals dive up to 1800 feet in search of their diet of lobsters, crustaceans, octopus, eels, and small fish. Gelman: It’s unlike other species, like elephant seals, they live in huge colonies, thousands of animals. Some species of dolphins, pups may stay with the mom for two years, longer even, socializing, and hanging out together. Monk seals it’s like, boom. It comes to a point, nature calls, and says to Rocky, You’ve given as much as you can. You need to preserve your own health. It’s time for you to go back and start eating. Unlike other seals, monk seals do not forage for food while nursing. If they did, they’d be gone for hours. After weaning, Gelman says, sometimes you’ll hear the pup vocalizing, but at that stage of their development, it’s usually, feed me, feed me, it’s not, I’m lonely. After weaning, Kaimana was taken from Waikīkī to the northern side of O‘ahu. HMAR staff and volunteers have continued to monitor her since. HMAR’s six staff and about a hundred volunteers fielded 3,400 monk seal sightings in the last twelve months, performing about fifty actual interventions for seals and sea turtles. They get about ten reports a day of monk seal sightings and ask the public to call their hotline whenever one is spotted. Gelman emphasizes every sighting is important because the seals are so endangered. Every occasion is an opportunity to track activity and condition of the animals, and document the findings for ongoing research. 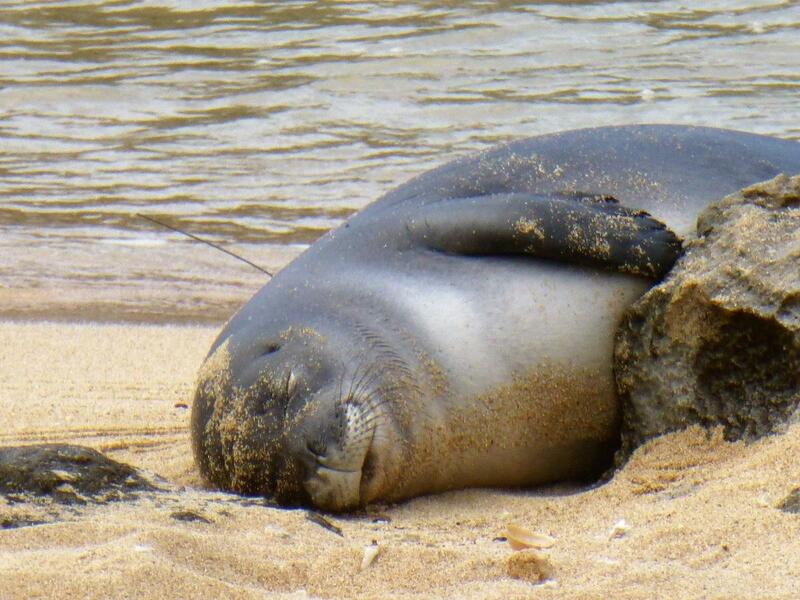 The HMAR hotline number to call to report monk seal sightings is 888-256-9840. HMAR also responds to sea turtles and other marine mammals in trouble via the same number. Hawai‘i’s green sea turtles and hawksbills are often seen in the ocean around the main Hawaiian Islands. Find out how to tell them apart, and more about their life in the extended interview posted here. Kaimana snuggling up to a wall along the North Shore of Oahu. Monk seals are amazing animals, they dive to over 1800 feet searching for octopus, eels, sea cucumber, small fish and other edibles. They need to eat about 4% of their body weight daily, that’s between 13 to 15 pounds of food, and spend anywhere from 8 to 18 hours at a time foraging. That’s why, Gelman says, they’re exhausted when we see them on the beach and really shouldn’t be disturbed. Monk seals begin to pup at about five years old, and there is no season, per se, though most pups are born between May and August. Please check the extended interview for a fascinating account of their mating process and reproductive cycle. Did you know seals molt, losing their skin and fur annually? Seventy percent of monk seal moms give birth on the same island annually, about forty percent in the same location. But you never know. Rocky, for example, has pupped ten times in her seventeen years, and all but Kaimana were born on Kaua‘i. At this point, Gelman says, Kaimana has been seen along ten miles of coastline on O‘ahu’s north shore and miles out to sea. Gelman: She’s been seen in the presence of other young seals, adult seals. She’s adjusting just fine to her environment. In 2016, the Hawaiian archipelago had about 1400 monk seals, 300 of which live around the main islands here. Forty or forty-five of the seals spend most of their time on O‘ahu. Over all, their numbers are up slightly, encouraging news though Gelman cautions Hawaiian Monk Seals are still very endangered. Call the Marine Animal Response hotline if you see one. 888-256-9840. Rocky and Kaimana on Waikiki Beach.